Delegation from US Congress visits Israel to examine issue of relocating embassy to Jerusalem. A congressional delegation sent to Israel to examine the issue of relocating the US Embassy from Tel Aviv to Jerusalem arrived this weekend for a fact-finding mission to assess the practical and political implications of the move. Chairman of the House Subcommittee on National Security Ron DeSantis (R-Florida), a member of the delegation, told reporters at a press conference Sunday evening that President Trump intends to stand by his campaign pledge to move the embassy from Tel Aviv to Israel’s capital, Jerusalem. Israeli journalists have been writing articles doubting Trump's intentions since the inauguration. “The American people are excited to see the embassy move from Jerusalem after fifty years,” said DeSantis, referencing the 50th anniversary of the liberation of the Old City of Jerusalem during the 1967 Six Day War. Contrary to media reports that the Israeli government and Prime Minister Binyamin Netanyahu had asked the White House to hold off on the proposed embassy relocation, Rep. DeSantis said Israel’s leadership was unified in its support of the move. 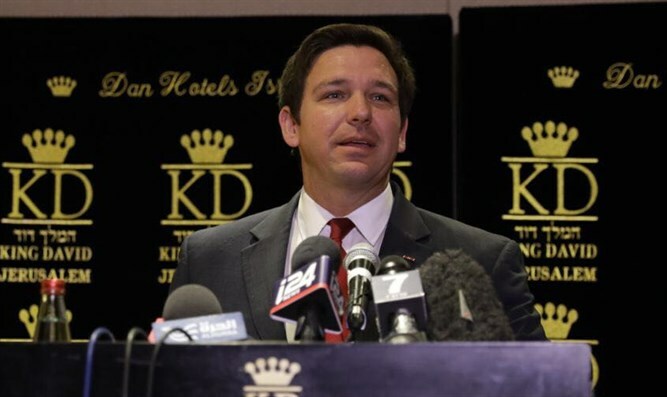 Regarding speculation by opponents of the embassy move that the relocation could increase tensions in the region, DeSantis said the threats seemed overblown. DeSantis added that by relocating its embassy, the US would likely cause other countries to do the same.